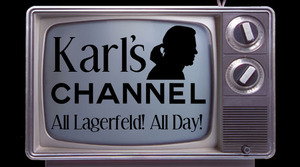 Could it be Friday and we haven’t written a word about Karl Lagerfeld all week? Good thing the week didn’t slip by without one item about the Kaiser coming your way. Germans are set to be treated to a four-hour documentary on Lagerfeld, slated to air in early September. He allowed cameras access to his life for over 16 months. In the process, he opens up about his career, personal life, and (we’re assuming) infatuation with a certain cat in the doc, entitled Mode Als Religion (Fashion as a Religion). Suzy Menkes, Linda Evangelista, Sarah Jessica Parker, Claudia Schiffer, and Diane Kruger are a few of the leading ladies in his life who sat down to talk about da man.